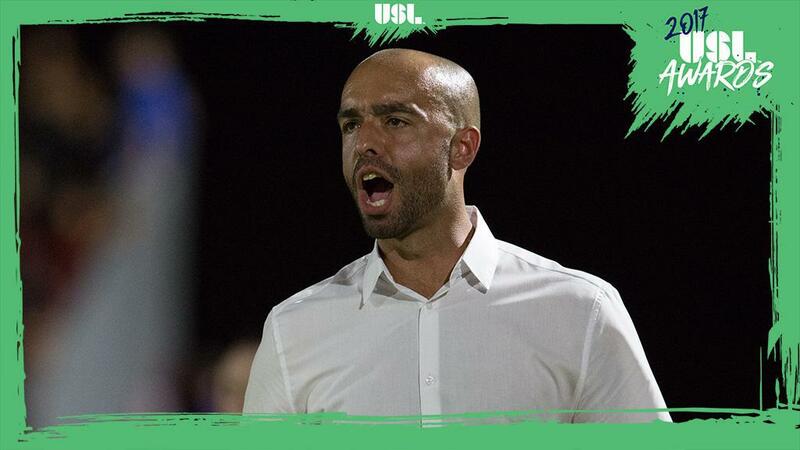 TAMPA, Fla. – The United Soccer League announced on Monday Real Monarchs SLC’s Mark Briggs had been voted the 2017 USL Coach of the Year after leading the club to the 2017 USL Regular Season Championship in a remarkable turnaround year at Rio Tinto Stadium. Briggs received 41 percent of the vote to claim the award, with Louisville City FC’s James O’Connor earning 31 percent to finish second and Reno 1868 FC’s Ian Russell recording 28 percent to finish third. The 2017 USL Awards were voted on by team management and a league-wide media panel that included representation from every USL market. Voting was conducted following the conclusion of the 2017 USL regular season. Briggs arrived with the Monarchs to serve as an assistant coach to Mike Petke, but when Petke was appointed Real Salt Lake’s Head Coach on March 29, one game in the Monarchs’ season, Briggs stepped up to lead the team. Briggs’ side put in a remarkable season, setting a USL regular-season record with a nine-game winning streak on its way to finishing five points clear of its closest rivals for the USL Regular Season Championship, while also finishing in the top four in the league in both goals scored and fewest goals conceded.